Mother Nature impacted a lot of the Week 3 action as many games were altered by severe weather. Several games in the southeast portion of the state were delayed, called final early, or postponed until Saturday or Monday. A few of the marquee games on the schedule up in the Kansas City metro area were pushed to a later start, but ended up being worth the wait. 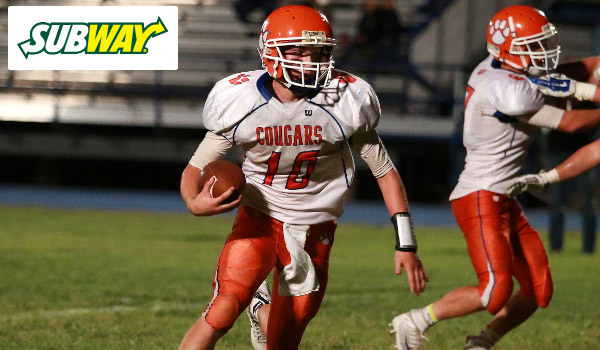 On this week’s edition of the Subway Friday Fresh Take, we’ll look at some of the top games in the state featuring ranked opponents and highlight a few other notes from Friday’s action. One of the premier games on the Week 3 schedule featured 6A No. 2 Blue Valley hosting 4A-I No. 1 Bishop Miege. The Tigers built a 14-point lead in the third quarter and held off Miege, 42-35. Blue Valley used a dominant ground game that produced 408 rushing yards on the night. Senior A.J. Totta carried 26 times for 191 yards and two touchdowns, while William Evans added 119 yards and two scores on 11 carries. Quarterback Colton McCumber added 97 yards rushing and two more touchdowns on the ground, while passing for 78 more yards. The teams traded touchdowns in the first half with Blue Valley taking the lead for good on a 13-yard touchdown run by Evans with just 38 seconds remaining in the half. The Tigers expanded that lead to 35-21 in the third quarter as Totta scored from 8-yards out. Miege quickly responded with a 58-yard touchdown pass from Carter Putz to Tommy Winklhofer to close the gap to 35-28 after three quarters. Evans would strike again early in the fourth quarter for the Tigers, running in from 24 yards out to build Blue Valley’s lead to 42-28. Miege answered mid-way through the fourth quarter on an 80-yard run from back-up running back Cameron Clark. The Stags got the ball again later in the fourth quarter with a chance to tie, but their drive stalled on downs in their own territory. Bishop Miege actually outgained the Tigers 541-486 on the night. The Stags’ quarterback Putz completed 17 of 29 attempts for 352 yards and four touchdowns. He connected with junior Jafar Armstrong seven times for 187 yards and two scores. Clark carried two times for 88 yards and a touchdown, while T. J. Goodwin carried 19 times for 78 yards for the Stags. Miege played without all-state running back Dawson Downing due to a wrist injury. Mill Valley, ranked No. 1 in Class 5A, outscored Derby 17-7 in the second half to knock off 6A’s No. 3-ranked Panthers, 27-20. Senior quarterback Logan Koch tossed a 28-yard touchdown pass to Tristan Milne on fourth-and-12 to give Mill Valley a 27-20 lead. Koch kept that pivotal drive alive by avoiding a sack and scrambling 42 yards deep into Derby territory. Derby had a pair of chances to tie the game late in the fourth quarter. The Panthers failed to convert on fourth down inside their own territory with about five minutes remaining, but got the ball back a short time later and drove deep into Mill Valley territory. Derby quarterback Brady Rust was unsuccessful on three attempts at the end zone, and a low snap on fourth down caused him to have to run with the ball. The Jaguars got the stop and preserved the 7-point win. The momentum of the game seemed to shift in the third quarter when Derby failed to convert on a fake punt at midfield turning the ball over to the Jaguars. Two plays later, Tristan Milne broke free for a 42-yard touchdown run to give Mill Valley a 17-13 lead. The Jaguars would add a field goal later in the third quarter to lead 20-13 heading into the fourth quarter. After Mill Valley missed a field goal early in the fourth quarter, Derby quarterback Brady Rust hit Kai Lemons on an 85-yard touchdown pass to tie the game at 20. Rust scored on an 18-yard run in the second quarter to give Derby a 13-10 lead at halftime. But the Panther quarterback was intercepted twice in the first half which led to Mill Valley’s 10 points. Rust’s second interception was returned 15 yards for a touchdown by Mill Valley defensive lineman Anthony Brown. Wichita Collegiate trailed Andale by 16 points twice in the second half before scoring twice in the final five minutes and winning 46-45 in overtime. Collegiate quarterback Austin Waddell scored from two yards out and then hit Jack Larsen on the two-point conversion to tie the score at 39 with 49 seconds remaining. Collegiate got the ball first in overtime and Waddell scored on a 5-yard run to give the Spartans their first lead of the game, 46-39. Andale would respond on their overtime possession with a Taylor Richter two-yard touchdown run to pull within 46-45. Coach Gary O’Hair decided to go for the two-point conversion to win the game. Richter took the snap and pitched back to Zach Meyer who then looked to throw a halfback pass, but Collegiate had brought pressure off the edge and Meyer was tackled for a loss. Andale scored 10 consecutive points in the second quarter to lead 18-8 at halftime. After the Spartan pulled to within 18-15, Andale tacked on two touchdowns to lead 31-15 after three quarters. Collegiate pulled to within 31-23 with 6:45 remaining on a Waddell short touchdown run, but the Indians would push the lead back to 39-23 with 5:43 left as Meyer went 69 yards for a score. Less than a minute later, Collegiate’s Nathan Burgoyne broke a 62-yard touchdown run to make it 39-31 and set the stage for Waddell’s score and conversion in the final minute. Ian Rukzik rushed for 320 yards and three touchdowns on 27 carries as Ulysses, ranked No. 5 in 4A-I, held off 4A-II’s top-ranked Holcomb Longhorns, 34-20. Ulysses jumped out to a 14-0 lead early before Holcomb pulled to within 20-12 at halftime. Rudzik would open the scoring in the second half with a 73-yard touchdown run to put the Tigers up 27-12. Holcomb would answer on a Trey Teeter short touchdown run to pull within 27-20 midway through the third quarter. The Longhorns would threaten again in the third quarter, but Ulysses stopped Holcomb on fourth-and-goal to preserve their touchdown lead. Shortly after, Rudzik was in the end zone again, this time fro 34 yards out to seal the game at 34-20. Lawrence defensive back Ivan Hollins knocked away a fourth-down pass in the end zone to preserve the Lions’ 14-12 win over Lawrence Free State. The Firebirds went on a 19-play drive to try and win the game, driving deep into Lion territory with 30 seconds remaining. Lawrence all-state defensive lineman Amani Bledsoe then sacked Free State quarterback Bryce Torneden back at the 20-yard line setting up Hollins’ heroics on the final fourth down play. J.D. Woods led Lawrence with 142 rushing yards and both touchdowns. His 5-yard touchdown run put the Chesty Lions up 14-6 early in the fourth quarter. Free State responded when Torneden scored from 1-yard out, but his two-point conversion pass fell incomplete. Bishop Carroll routed crosstown rival Kapaun Mount Carmel 47-7 on Friday night. The win marked Carroll’s 17th straight in the series. The Golden Eagle defense held Kapaun to only 215 yards of total offense, forced a safety, and returned a fumble for a touchdown. Carroll led 23-7 after the first quarter and 44-7 at halftime. Quarterback Jake Allen rushed for 104 yards and two touchdowns and passed for 109 yards and two more scores. Garden Plain used a balanced rushing attack and a suffocating defense to top Central Plains League rival Conway Springs, 27-12. Six different ball carriers combined for 192 rushing yards for the Owls. Alec Becker scored a pair of rushing touchdowns for Garden Plain. Garden Plain’s defense held Conway Springs to just 88 rushing yards on the night. The victory was the Owls’ first over the Cardinals since 2012. Pittsburg built a big lead and a suffocating defense to shutout SEK League rival Fort Scott, 37-0. The Purple Dragon defense limited Fort Scott to 5 yards of total offense for the game. The Tigers had negative 7 rushing yards and converted only one first down. The Dragons also scored on a 15-yard fumble recovery by Dylan Untereker in the third quarter. Pittsburg led 24-0 at halftime behind a steady offense that had produced more than 300 yards in total offense. Quarterback Spencer Turnbull rushed for a touchdown and tossed a 38-yard touchdown pass to Elijah Harris. The teams waited out a long delay early in the third quarter when the power went out in Fort Scott. Humboldt held off Caney Valley 22-20 on Friday night snapping the Bullpups’ 41-game winning streak in the Tri-Valley League. After a weather delay, the Bullpups tied the game at 14, but Humboldt quickly responded with a touchdown and two-point conversion. Caney later scored, but was unable to convert the two-point conversion to tie. The Cubs were the last TVL team to defeat Caney Valley, 24-8 back on October 3, 2008. Quarterback Kade Urban rushed for six touchdowns as Otis-Bison defeated Ness City 58-20 in a battle of unbeaten teams in the Central Prairie League. The Cougars led 28-8 at halftime with Urban and Brad Lightfoot each scoring twice. Urban scored the next four touchdowns in the second half to build the Cougar lead to 58-14. Below is a list of games we know are being finished at a later date due to the weather on Friday night. If you have further information or know of any games we are missing, please contact us at matt@kpreps.com .